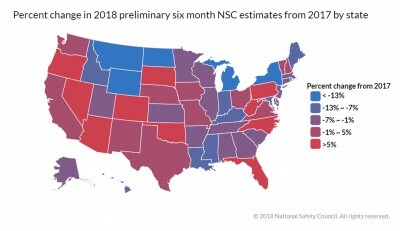 According to the National Safety Council's preliminary estimates, the U.S. is on track for its 3rd straight year with close to 40,000 roadway deaths. In the first six months of 2018, approximately 18,720 people have died on U.S. roadways, down less than 1% from 2017. You can read the full report here. With the Labor Day holiday weekend approaching, and an estimated 420 roadway fatalities that will occur, the NSC is urging motorists to utilize their tools, tips and resources available to ensure roadway safety. For more information, please visit the NSC's website. Remember, as a member of the ATA Comp Fund, your membership with the NSC is provided at no additional cost. Contact our Risk Management Team today for more information.